Weddings at Hotel Atitlán Hotel & Gardens set a new ideal for a romantic, elegant setting and a sophisticated environment in Guatemala. 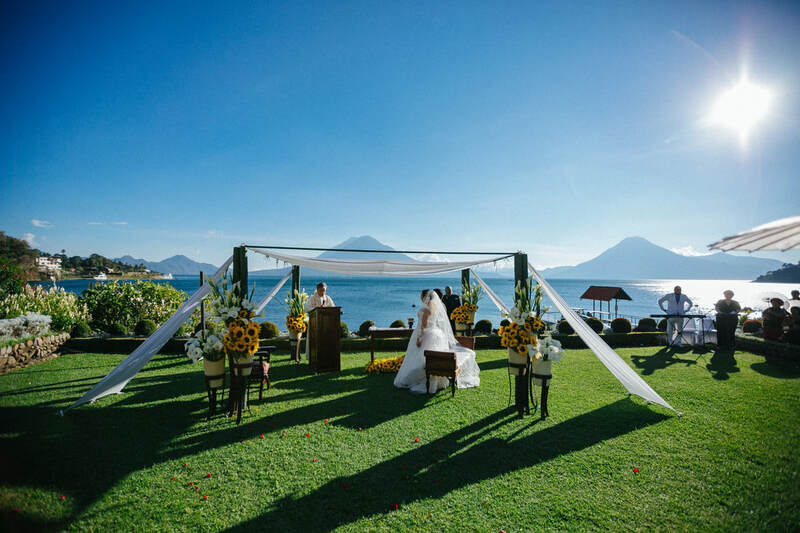 From an intimate family celebration to a formal wedding for up to 500 guests, our botanical gardens and spectacular panoramic views of Lake Atitlán and its volcanoes create unforgettable, lifelong memories. Our experienced and skilled Wedding Specialist works with each couple to plan and design an event that will exceed every expectation. ​During the rehearsal and on the big day itself, we are close at hand to support you so that you can focus on enjoying your celebration. Since we are tucked among the hotel’s lush gardens and cobblestone pathways; our thatched roof “Ranchito” offers a splendid indoor/outdoor setting for weddings or choose any other location in our botanical gardens for your event. Maybe you can envision a sunset ceremony with a cocktail reception on the outdoor amphitheatre, which can give you a wonderful opportunity for you to mingle with your guests before gathering for a candlelit banquet dinner. We can also arrange pre- and post-wedding events at our restaurant, which offers captivating lake views both in the dining room and on the poolside terrace. ​Whether planning a grand wedding or a small ceremony with close family and friends, Hotel Atitlán offers the ideal venue for your special union. Your Hotel Atitlán wedding specialist is your dedicated contact, guiding you through the wedding planning process from start to finish. Your wedding specialist can also assist with menu planning and suggest reputable vendors that will help make your wedding unique. During the rehearsal and on the big day, we will be close at hand to support you. When you are planning a wedding, chances are you have a million and one things on your mind; our helpful event planning team makes it easy to coordinate the details, so you can focus on enjoying your celebration. 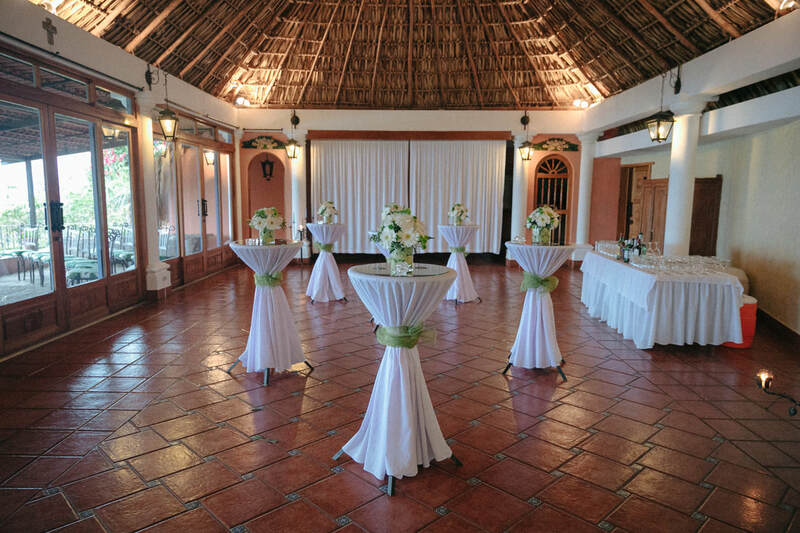 Set the tone for your big day with a wedding rehearsal dinner at Hotel Atitlán. El Ranchito and La Terraza offers a private retreat to gather close friends and family the night before your wedding. Whether a formal dinner or casual cocktail party, we will help you plan and host an evening that’s as unique as you are. We can also arrange other pre- and post-wedding events at our restaurant or on the poolside terrace. Tucked among the hotel’s lush gardens and cobblestone pathways, our thatched roof El Ranchito and La Terraza offers a splendid indoor/outdoor setting for weddings. Imagine a sunset ceremony in our outdoor amphitheatre surrounded by flowers with a panoramic view of the lake and volcanoes creating the perfect setting in which to exchange your vows. ​You may also choose any other location in our botanical gardens for an unforgettable ceremony. ​Hotel Atitlán is the perfect place to take scenic wedding photographs as you roam around the botanical gardens with your photographer for stunning pictures with your spouse. Your guests can enjoy the time to drink exotic cocktails, wines and tropical beverages in our garden or around the pool. ​Toast to your new beginning and let the magic of the day continue as you take in the ambiance created just for you. From our lovely garden designed for receptions to a candlelit banquet dinner, Hotel Atitlán helps coordinate every detail of your wedding reception, while our innovative dining options and stylish venues make your party unforgettable. Our wedding banquet services provide for the trendy to the traditional and the extravagant to the tastefully modest. Whatever your tastes, you’ll find a variety of dishes to choose from, and our chef can customize your menu to create an exceptional meal that meets your highest expectations. We are pleased to offer you and your guests a special group room rate for a contracted room block of 10 or more rooms, held for you up to 30 days prior to the event. Guests may call in and make reservations on their own using the room block name. ​Room accommodations must be guaranteed with a credit card and require a one-night, non-refundable deposit for room and applicable tax. Our complimentary suite will be provided to the couple on their wedding night. Step into a restful environment to refresh and centre yourself before the big day. Take a relaxing massage in the terrace of your suite or simply enjoy some exotic cocktail in our Jacuzzi. ​Let us help you to coordinate the morning of your wedding with salon services, our professional hairstylist and other beauty services. Say goodbye to your guests with a post-wedding brunch before heading off to your honeymoon. ​200 or more guests can enjoy a brunch buffet throughout the morning as they exchange memories of your big day while taking in breath-taking lake views from this privileged location. ​Inspire yourself and others with unique settings for a small meeting or an incomparable event. Our conference room is equipped with modern technology complemented by indigenous touches to reflect a sense of locality and style we’ve been offering guests for more than 40 years. Our conference room offers all you need to host an inspiring meetings or corporate events. Your important event, conference or celebration deserves a venue of equal significance a place that will impress your guests and linger in their memories. Hotel Atitlán offers you meeting room and event facilities every bit as impressive as our leisure amenities. Whether you are looking for the perfect venue for your corporate event, an inspirational venue for staff training or team building, or a magical wedding venue, the Hotel Atitlán is the perfect choice. ​Each event hosted at Hotel Atitlán is arranged to exceed your expectations, whether they might be to meet your business objectives, to motivate, inspire and reward your guests with an event unlike any other or to simply gather with friends and family to celebrate a special occasion in a truly special place. Customer service and satisfaction are our number one priorities, and each is achieved through an unwavering commitment to quality, flexibility and impeccably planned events. We love doing what we do, and we believe this is revealed in every event we host, which ensures that our guests return to Hotel Atitlán again and again when planning gatherings.